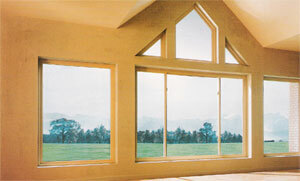 One of many cornerstones of the Reflections line is the Double Hung. Classic beauty and uncompromising strength are just the beginning. With both mechanical of fusion-welded framing available, a multitude of exclusive design features reveal enhanced performance. A weather-resistant meeting rail overlaps and interlocks sash tightly for greater thermal resistance, and a perfectly, aligned tilt-in/lift-out sash provides trouble-free operation for the life of the window. Additionally, when it comes to architectural detailing, offer timeless aesthetic appeal. Either as a stand alone window or used in conjunction with other styles, the Slider is another signature to the Reflections line. Sashes glide effortlessly on self-lubricating Celcon slider rollers for the life of the window. While roller tracks on other manufacturers’ slider windows may bow over time from a lack of center support, Reflections Sliders have a triple-walled roller track to keep the track level. This additional center support wall allows the sashes to continue to operate with ease. The Reflections Slider makes a bold statement. The architectural appeal of the beveled exterior provides the flexibility of blending with any home style – from wood or vinyl siding to stucco and brick. And the interior appeal is guaranteed to inspire the imagination. Tradition, innovation, drama and functionality are all under the canopy of the Reflections Casement. Sashes are locked with an advanced system – securing the sash at multiple points with one, easy-to-use handle. Corrosion-resistant hardware supports the sash when opened, allowing for easy interior and exterior cleaning from inside the home. Casement windows can be used to produce a variety of effects – mulled together in a multi-lite configuration with Awning windows to form a dramatic wall of windows or used individually. 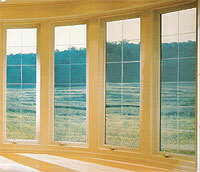 Whether used alone or in a group setting, Reflections Casement windows are an expression of style. 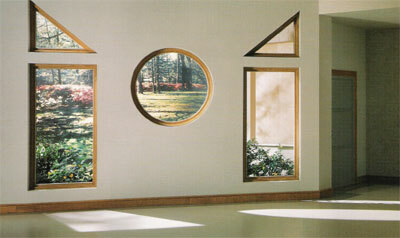 Express your view of the world with the unique shapes and designs of Reflections Picture and Geometric windows. Whether used on their own or in conjunction with other styles, Picture and Geometric windows provide a dazzling effect everywhere they are used. The fusion-welded frame construction and unique exterior designs provide strength and beauty simultaneously, while the vast array of grid and glass options open the door to bold creativity.